This evening I made a delicious and simple dinner. We had quick and easy pulled chicken that I prepared in my Instant Pot (I have the 8-quart version). I already had barbecue sauce that I had made earlier in the week, but you can use your own personal favorite sauce. The recipe only uses 1/2 cup of sauce. 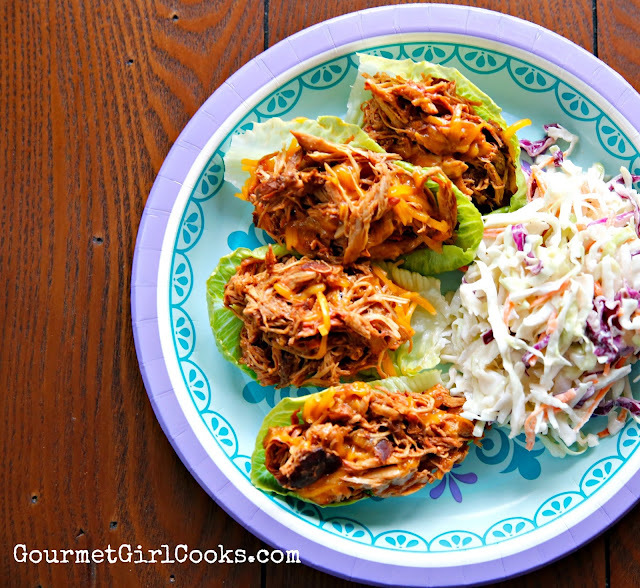 I served the pulled chicken in baby romaine lettuce cups and it was absolutely delicious! This is the second time I've made it and it is awesome. You will never believe you are eating chicken breasts because the meat turns out so tender, juicy and flavorful. Before filling the mini lettuce cups, I stirred in some shredded sharp cheddar cheese to make it extra yummy. I served my Easy Coleslaw alongside it. I actually prepared the pulled chicken last night and made the coleslaw earlier this morning, so all I had to do to get it on the table this evening was heat the pulled chicken and pull out the bowl of coleslaw. We had very heavy rain overnight and a good part of today which made the humidity crazy. It was 70 degrees this morning with 89% humidity -- yuck! I've included the link to my coleslaw recipe above and added the super easy Instant Pot recipe for the pulled chicken below as well as the recipe for the barbecue sauce immediately underneath. Feel free to use whatever sauce you like best. I like a little mixture of sweet and heat in my sauce. I snapped a quick photo below. Oh, and yes, in case you are wondering...that is a paper plate. Like I said, we kept dinner super easy tonight. Enjoy! Select the "Saute" setting on your Instant Pot. When it begins to get hot, add oil to the bottom of the pot. Lightly dust the chicken breasts with chipotle powder, if desired. Place chicken in the Instant Pot and saute until lightly golden, about 5 minutes. Turn chicken breasts over and repeat on the other side. Select the "Cancel" button to stop the saute function. Spoon barbecue sauce over top of the chicken. Pour water into pot. Close and lock lid, making sure your silicone sealing ring is properly installed (if not, it won't be able to build pressure). Make sure the steam release button on top of the lid is pointed towards "sealing". Select the "Poultry" setting and increase the pre-selected cooking time to register 20 minutes. After the cooking is complete, allow it to "naturally release". You can safely open the lid once your float valve goes down. Using 2 forks, pull the chicken apart while in the pot until shredded and mixed with the juices. Taste for seasoning. Serve on buns or in small lettuce cups topped with shredded cheese, if desired. Combine ingredients in a saucepan over medium heat. Simmer uncovered for approximately 15 minutes, stirring frequently. Refrigerate any leftover sauce.